These Programs are conducted by Centre for Distance and Open Learning (CDOL) of the University. Candidates can check the complete information of JMI CDOL 2019 such as application procedure, eligibility criteria and other information on this page below. Eligibility: 10+2 or equivalent from a recognized board. Eligibility: Candidate with a least 50% marks either in the Bachelor’s degree or in Master’s degree in Science, Commerce, Humanity. Candidates who have completed a NCTE recognized teacher education programme through face to face mode. The B.Ed Admission Entrance Test will be of 2 hours duration and will comprise of 100 multiple choice questions. Each question will be of 01 mark. The medium of entrance test will be ENGLISH. General Knowledge/Awareness (including Indian Geography/History/Constitution/Economy). 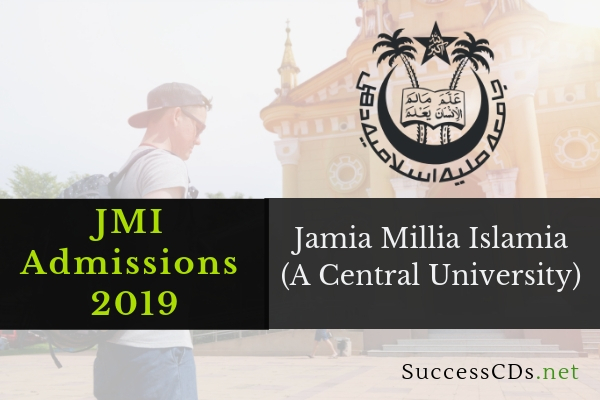 The venue of Admission Entrance Test will be Jamia Millia Islamia, New Delhi. However, CDOL/JMI may identify additional Entrance Test Centres if the number of applicants in a particular region is fairly large. Necessary information in this regard will be notified on the University website. Eligibility: Bachelor’s degree (10+2+3) systems in any discipline from a recognized university. The downloaded form should be accompanied with an application form fee of Rs. 500/- for all other programmes and Rs. 700/- in case of Bachelor of Education (BED) programme through Demand Draft drawn in favor of Jamia Millia Islamia and payable at New Delhi. For any query, candidates are requested to check the official website.